A visit to Melaka will not be complete without getting to know and to honour one of Melaka’s, and in fact one of the Malaysia’s, all time legendary heroes – Hang Tuah. Hang Tuah was a great Malay warrior who showed an extraordinary and unbelievable loyalty to the royal family, even at the expense of his own well being. Stories of his physical and emotional strength captured the hearts and captivated the minds of generations of Malays. He made his debut into the royal scene when he fought against a village man who was running amok in a local spot called Kampong Duyong. The Sultan saw potential in him, and hence knighted the young man. Since then, Hang Tuah’s popularity rose as he made waves in the royal courts. Serving his time in the Melaka (often spelled as ‘Malacca’ in English) Sultanate, with an empire spanning vast lands, Hang Tuah’s life was nothing short of colorful. A renowned and trusted ‘laksmana’ (admiral), he braved the seas supervising the China-India trade route. Throughout his numerous expeditions, he encountered various adventures of both the violent and romantic variety. He defended Melaka from enemies (mainly from Siam (now Thailand) and Acheh (in Indonesia)) using his exceptional skills at martial art (namely the Malay ‘silat’ – that involves dramatic stances including flying in the air!). Alas, Hang Tuah lost his life due to a scandal that involved a woman. The mausoleum is not much different from other old Malay cemeteries, except for the fact that the body of Hang Tuah himself may be laying underneath. 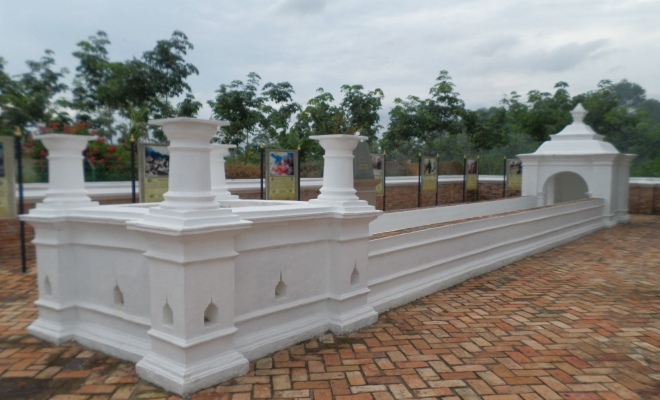 Still, tourists from overseas might find the sight fascinating, as the tomb stone is constructed differently from the ones found outside of Malaysia. If you are unfamiliar with this side of the country’s feature, head for the mausoleum. After all, it is not very far from wherever you are likely to be in Melaka. Indulge in the light reading materials affixed on boards at the side of the tomb, that tells stories of Hang Tuah’s exploits. There’s nothing like making a trip to Melaka’s glorious past to fully appreciate the extent of this magnificent man’s influence on present day local thinking.